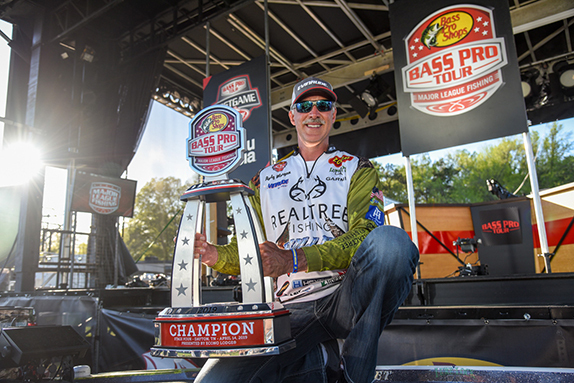 Kevin Lasyone won the Sam Rayburn Reservoir Southwestern FLW Series by a 10 1/2-pound margin. 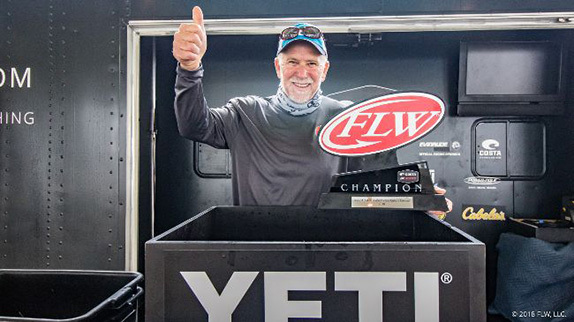 Only two of the three scheduled days were contested at last week’s Sam Rayburn Reservoir Southwestern FLW Series, as a thick blanket of fog enveloped “Big Sam” on Saturday and just wouldn’t dissipate. Even had the top 10 been allowed to fish, it’s unlikely anybody would’ve overtaken Kevin Lasyone. The former FLW Tour pro from Dry Prong, La. averaged 26 1/2 pounds over the first 2 days to build a 10 1/2-pound lead. He was declared the winner when the fog didn’t clear by 11 o’clock on day 3, causing FLW officials to call a halt to the event. Not only did Lasyone have a massive advantage, but he hadn’t even leaned hard on his best stuff yet – he’d been pulling out early to ensure that his fish lasted him all three days. “I’d have loved to have been able to fish the third day, or stayed there all day on one of the other two days, just to see how much I could catch there,” he said. He boxed 31-06 on day 1 and 21-11 the following day for a 53-01 total that left the remainder of the field far in his wake. Runner-up T.J. Goodwyn finished with 42-09. It was the most significant victory of the 56-year-old’s career and earned him $54,200. He’ll be back at Rayburn this weekend (his home is a 2 1/2-hour drive away) for an ABA Dodge Ram Series event and if the offshore schools he exploited are still in the same places, he plans to hammer them again. 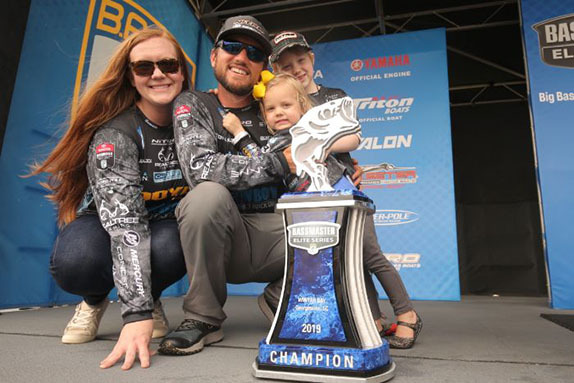 The Red River is Lasyone’s home waters, but he also has a great deal of experience at Rayburn and nearby Toledo Bend Reservoir. He finished 4th in a BFL at Rayburn in January. With the region having been in the midst of a warm spell, a lot of the competitors in last week’s Series event were prompted to head toward the banks. Not Lasyone. During the event, he exploited one school that he’d pinned down in practice and another that he located on day 1 of the tournament. “They were only about 75 yards apart. The fish in one of them were real healthy – they were 2- to 7-pounders and shaped like footballs. The other one had some big fish, but they were just pulling up and starting to feed for the spawn. His massive day-1 bag, which included an 8-pounder, was caught on a V&M Pacemaker Flatline Football Jig. His day-2 haul was amassed via a combination of the jig and a V&M Wild Thang Worm with a half-ounce weight. The fish came from 25 to 30 feet of water. With either bait, he made extremely long casts. “I wanted to stay way off the fish and not get up there where I’d disturb them,” he said. The color of the jig is an old-school combination that the company calls “sneaky Pete.” It’s black and blue with some gold mixed in. The trailer he used for this event was a V&M J-Bug (watermelon red with just the tips of the legs dyed chartreuse). He used a 7’4” V&M Pacemaker rod, a Lew’s casting reel (7.5:1 ratio) and 20-pound Seaguar Red Label fluorocarbon line. For the worm, he employed the same rod and reel with 17-pound Seaguar InvizX fluorocarbon. Lasyone, who derives most of his living as an installer of metal outbuildings and doing maintenance work for the six tire stores and propane company owned by team-tournament partner Randy Despino, competed on the Tour full-time for three seasons (2006-08). 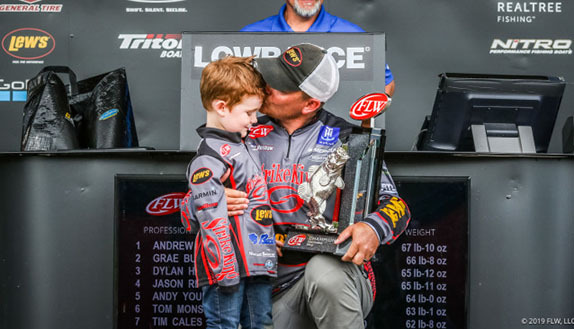 His best finish on the points list was 70th and his highest placement in a tournament was a 13th at Lake Murray. He’d consider going back, particularly in the wake of this victory. “I’ve thought about it a lot and I think I fished (the Tour) at the wrong time in my life,” he said. “I should’ve either done it earlier or right now. I had the money when I did it, but funds is the deal now. If I could get a sponsor to pay the entry fees, I don’t have any doubt that I could get out there and catch them.